Beautiful Cambria, California sits on the coastline between the bustling cities of Los Angeles and San Francisco. Known for its bucolic views and year-round temperate climate, Cambria boasts a rocky coastline, miles of beaches, lush Monterey pines, and Hearst Castle. Indeed, it makes a worthy vacation destination! However, to live there is a privilege unlike any other. And there is no dream home in that enchanting seaside town more impressive than Retreat at Cambria. As you come up the drive to this luxury home, you are greeted with well-designed landscaping and extensive hardscaping. Even the driveway has personality! After it sections off toward different buildings on the estate, it circles in front of the home around a stunning statue and water feature. 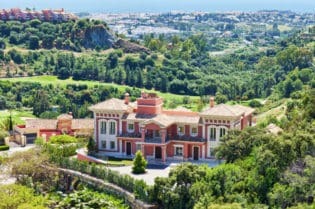 Surrounding the house, 30ft Canary Island palm trees tower over manicured gardens dotted with elegant sculptures as walking paths meander throughout. 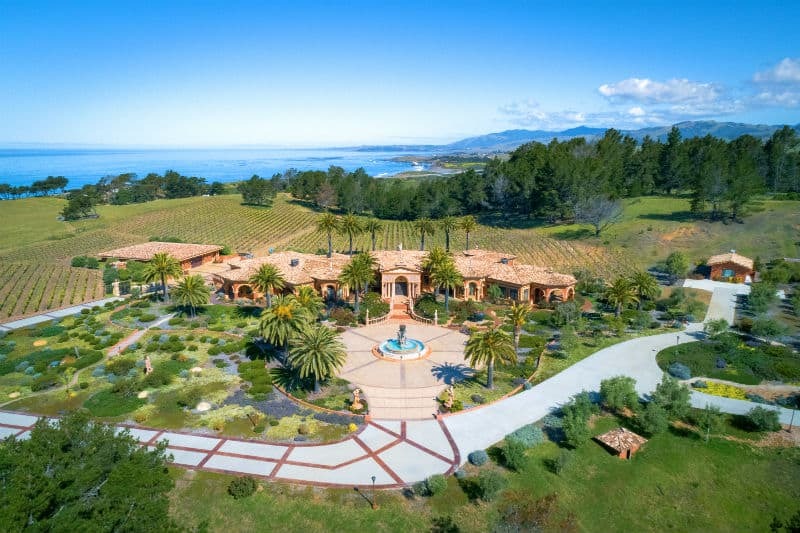 Beyond the expertly-maintained gardens, acres of grapevines cascade toward the legendary Pacific Coast Highway and the blue waters of the ocean. Retreat at Cambria has all one could want in a dream home and more. 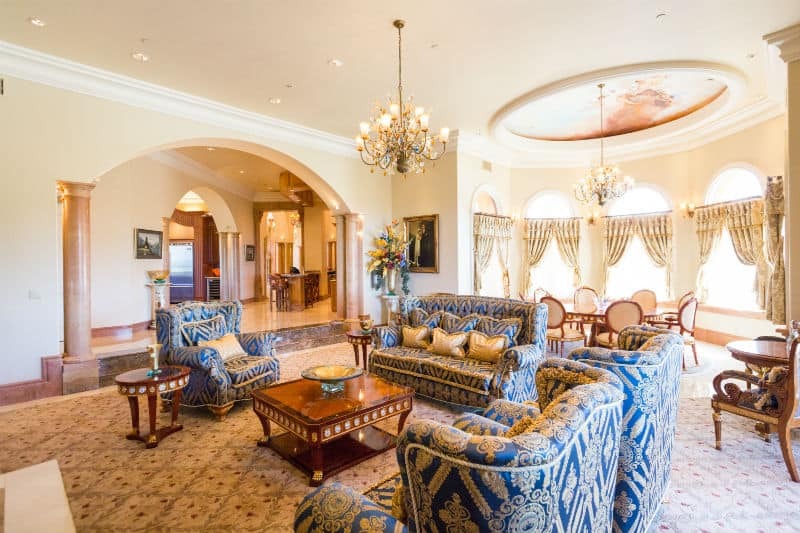 The main residence on the property has 5 bedrooms, 5 full baths, and 3 partial baths within its 14,000 square feet. Grand copper and bronze doors usher you into a domed rotunda. 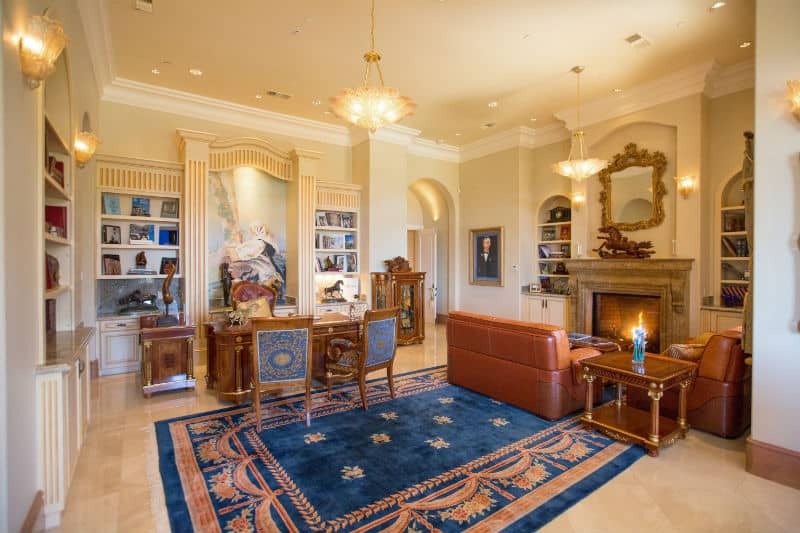 With a nod to the classical aesthetic, this Palladian-style home is accented with ornate murals, intricate woodworking, and Travertine flooring. An abundance of natural light cascades through the oversized windows and French doors present in nearly every room. These doors provide for exquisite views of the ocean as well as lead to the grounds. Just one glance into this home will assure you it is steeped in luxury. The main kitchen is surely chef quality! The Viking professional appliances include twin refrigerators, dual ovens, a wine cooler, and a 6-burner gas range. The enormous center island and surrounding counters provide ample natural stone work surfaces. In addition to a breakfast room, the kitchen has easy access to the great room and dining room. Also, this dream home has a separate catering kitchen with a butler’s pantry. The master accommodations are one of the many highlights of this luxury home. In fact, it is a sanctuary all to itself. 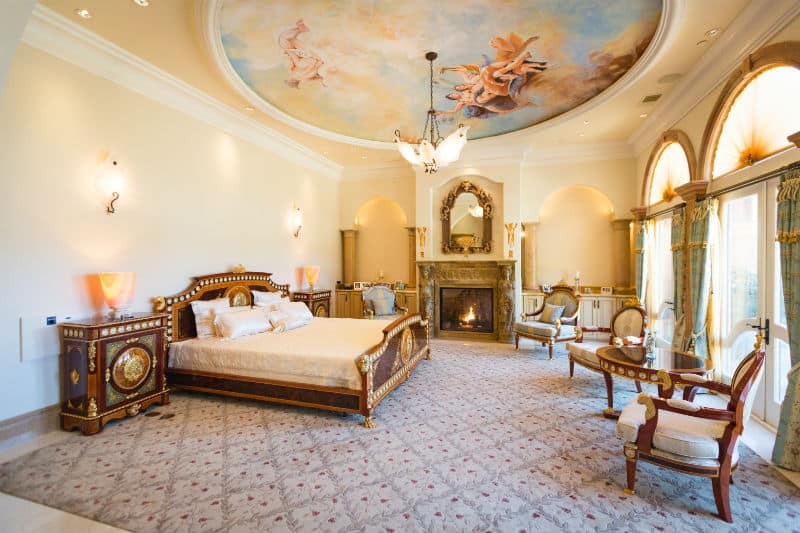 The spacious bedroom, featuring a beautiful antique fireplace and an impressive ceiling mural, has a sitting area, wet bar, and direct access to an ocean view terrace. Any fashionista would adore this master with its dressing area and 2-story walk-in wardrobe. And it even has off-season wardrobe storage! Not surprisingly, the master bathroom is palatial. Throughout, the gold tones add to the royal feel. Large dual vanities provide ample his/her space. The round spa tub nestles against a trio of tall windows. 12-heads surround the walk-in steam shower. And the sauna is ready to relax stressors away. Spread across the 80 acre parcel, you will find countless treasures and brag-worthy features. For instance, dazzle your friends with a glass of Pinot Noir grown in your own 6,200 vine vineyard. While hosting a party at your full-service outdoor kitchen complete with a pizza oven and beer taps, treat guests to a tapenade made with home-grown olives. Or show off your extensive car collection with the garage capable of showing up to 60 vehicles. And while the property does not currently have a tennis court or pool, there is ample space to build both! This luxury estate is also an equestrian’s paradise. Not only does it have a 5 stall barn and a tack room, it also has a lovely bridle trail perfect for a relaxing ride. Retreat at Cambria has breathtaking views of the Pacific coastline and the rugged mountains in the distance. This expansive property abuts the National Marine Sanctuary and other conservation lands, preserving privacy and seclusion. Homeowners can enjoy the estate on carefully groomed hiking trails. In addition, the property borders San Simeon State Park allowing easy access to additional miles of trails. 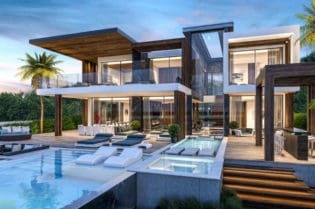 But more importantly, this dream home’s unique location provides the perfect spot to view whales and other sea life in the protected waters offshore. And as the world’s entire population of gray whales pass the Cambrian coast twice yearly, every winter and spring promises a memorable experience. 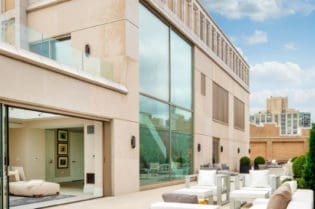 Indeed, this luxury estate left no stone unturned! In addition to the main home, Retreat at Cambria has a 1 bedroom/1 bathroom caretaker’s house. The estate also benefits from on-site administrative offices. 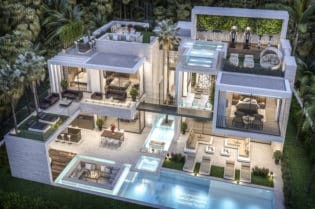 And as yet another luxury, should the occasion arise, this dream home has its own private helipad as well as helicopter storage. This smart home also takes California’s drought issues into consideration. In addition to the 2 wells on the property, it is connected to the city water. An underground rainwater catchment system and water storage system provide extra assurances. 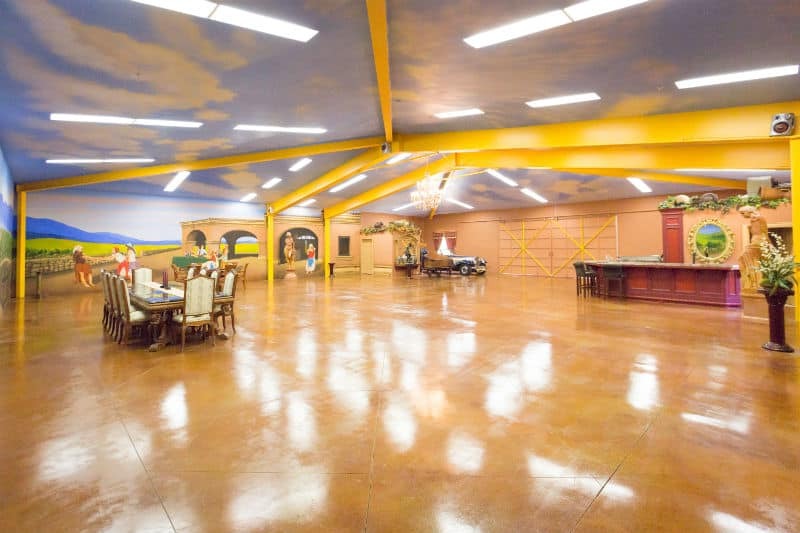 This home also comes with a world of entertaining opportunities. Within the home, enjoy a movie in the theater room. Welcome guests in the great room, complete with a 30-ft onyx bar. Or host a wine event in the 3,500 bottle wine cellar and tasting room. But the decadent amenities don’t stop there! 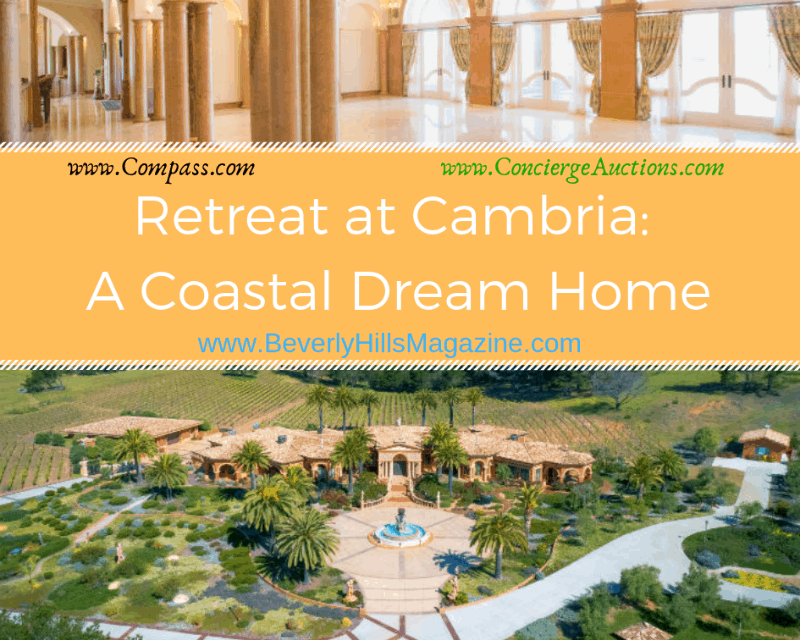 In fact, Retreat at Cambria even has an entertainment hall, a pavilion with a music stage, and an ocean observation lounge. Of course, with these wealth of features, homeowners should certainly be expecting guests. As such, the separate 4 bedroom guest house has a private veranda and garage, sure to keep overnight visitors completely contented. 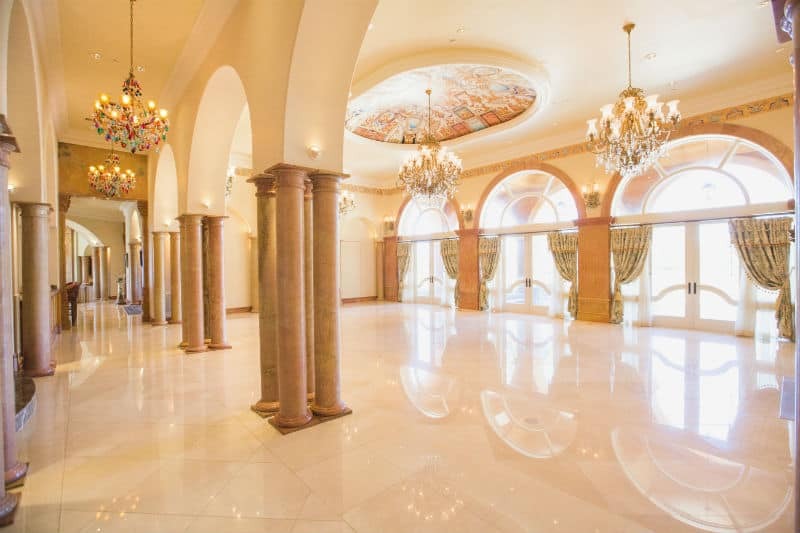 Concierge Auctions lists an opening bid of $60 million for this exquisite dream home. A $100,000.00 bidder deposit is required.